On May 22nd through the 24th National Grange sponsored the National Grange Annual Legislative Fly-In. Gordon Gibson, Phil Prelli, Alma and Bruce Graham flew to Washington DC to attend the Fly-In which was held at the National Grange headquarters at 1616 H Street. This was the first Fly-In presented by our new National Legislative Director, Nichole Payla Wood. We were treated to a VIP tour of George Washington’s Mount Vernon Estate and Gardens in Alexandria, VA. Do you realize that the outside of Mount Vernon is made out of wood carved to look like stone blocks? George Washington greatly enjoyed farming and animal husbandry. The estate is still a working farm using heritage seeds and livestock that can be traced back to his farming. Nichole presented information packets and briefed us on some issues that are presently pending on Capitol Hill. Monday included a working breakfast and dinner with speakers from different organizations talking about issues we were promoting. On Tuesday our luncheon was present by AT&T who is working with us towards expanding broadband to rural areas. National Grange had previously made appointments for all attendees with Senators and Congressmen from our respective states. After the tour of Mount Vernon we were dropped off at Capitol Hill to begin our appointments. These appointments continued on Tuesday morning. 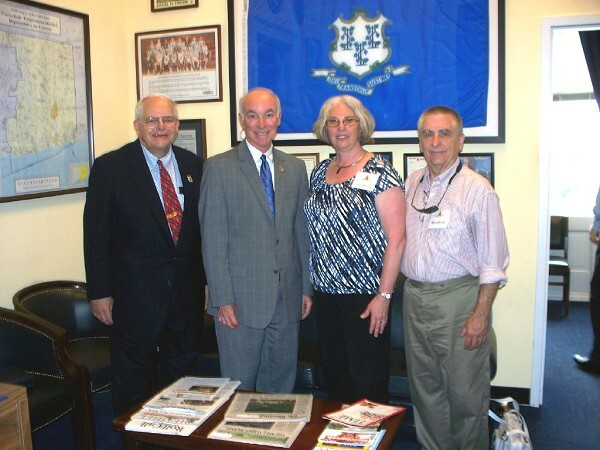 The group from Connecticut stopped in at Senator Lieberman’s office and met with one of his staff members. We then moved down the hall to Senator Blumenthal’s office to meet with one of his staff members. We had the pleasure of actually briefly meeting Senator Blumenthal while waiting for our appointment. Later in the afternoon Gordon, Bruce and I (Phil had a National Executive committee meeting) moved over to the house side of the hill for meetings with 1st district Congressman Lawson’s staff then on to meet with Congressman Courtney of the 2nd district. We met with Congressmen Courtney and one of his staff members for 45 minutes and were very grateful for the time he gave to the Grange. Congressmen Courtney is a member of the Federal Agricultural Committee so we inquired about the upcoming 2012 Farm Bill’s progress. One of the first tasks is how to define rural. This can be quite different in different areas of the country. We also suggested that agricultural block grants to states not be too restrictive to allow states to efficiently maintain them according to use. National Grange had presented us with 3 issues that we communicated to our Assembly members. The first issue is HR 872, the Reducing Regulatory Burdens Act. This act has actually already been passed in the House and is pending in the Senate. In the 1970’s Congress enacted the Clean Water Act (CWA) to regulate federal waters and the Federal Insecticide, Fungicide and Rodenticide Act (FIFRA) to regulate pesticide reviews, sales and use. In 2009, the 6th Circuit Court of Appeals ruled that any residues that may remain after pesticide use are pollutants and overturned the EPA’s 2006 rule permitting applying pesticides over and near water. Now multiple permits from multiple agencies are required for applying pesticides near water. This added burden affects pesticide controls of such as mosquitoes, forest canopy insects, algae or invasive aquatic weeds and animals. It has become an added burden to municipalities, states and agencies such as the Agricultural Experiment Station in Connecticut. FIFRA has already researched and authorized the proper pesticides that are allowed to be used near and in water. The government is already on record agreeing that the courts were wrong and that pesticides when applied consistent with FIFRA labels are not pollutants. This bill would amend FIFRA and CWA to declare that only one permit would be required for the labeled use of any registered pesticides. The second bill discussed is SR 575 which is an adjustment to the Dodd-Frank Banking Act that was approved last year. The Dodd-Franks Act set caps on fees that banks could charge for debit/credit card swipes. This is the fee that is charged to the retailer for using the credit card swipe machines. This fee is one way that banks make money so they can offer ‘free’ services to customers such as free checking and ATM use. This bill asks that the cap on fees be held off for another 18 months so that this cap can be studied to fully assess how it would affect rural and small banks. There is a concern that capping these fees could be detrimental to rural banks and that customers would lose their ‘free’ services. The Grange does not support or oppose the cap to the swipe fees. We are just asking that it be studied further before enacting. The third bill is HR 452. This concerns the recommended creation of the Independent Payment Advisory Board (IPAB) which is a result of the Health Care bill last year. This board would be created to control Medicare spending should Medicare costs exceed the rate of inflation plus 1 percent. While the intent is good there is concern on how the members of this board would be appointed and the power that it would have after creation. Any recommendations by this board would immediately become law without any interaction with any government branch. The President cannot even overrule their recommendations. The only way that a recommendation could be overturned would be 3/5th majority vote of Congress. The Grange is concerned about the power and lack of checks and balances with this board and asks that portion of the bill be repealed. Our country was created with multiple branches to maintain a check and balance of government and this bill would exclude this check for IPAB.